For reconstructions of this object, please visit our portfolio page. The Witham bowl is a great example of the mystery and legend that often follows archaeology and one of the finest examples of Anglo-Saxon silverware ever discovered. It was supposedly found in 1816 and last seen in 1868, when the bowl disappeared, only to become famous through the discovery of a ‘carefully executed’ watercolour of the lost artifact by T D Kendrick in 1941, the three views of which below show angles of the bowl, with a slice, enhanced by a watercolour wash, unsigned and undated. Watercolour drawing showing the Witham bowl sliced. Society of Antiquaries of London. Various views of the bowl. Society of Antiquaries of London. According to the original source, the discovery of the drawings in the 1941 was coincidental whilst a selection of books were being chosen for evacuation from the Society’s library during the second world war. The images were immediately published, accompanied by the label ‘A late Saxon hanging-bowl’, where it was described as ‘the most remarkable piece of pre-Conquest plate ever found in England’. The bowl therefore represents an incredible piece of archaeology and understandably, Kendrick desperately sought to trace the whereabouts of the ornate artifact that he labelled as a ‘supremely important and very precious antiquity’. Unfortunately, his efforts to discover the whereabouts of the lost object were unsuccessful and with its fate unknown still, over 70 years later, his last known correspondence on the subject was depressingly dismissive. ‘I had no success in chasing the Witham bowl. I remember dimly that I had some kind of clue, possibly from Tom Lethbridge, but I am quite clear that the inquiry was unsuccessful’. What is clear to see however from the drawings above is the ornate nature of the bowl, that includes meticulous metalwork, gold glass millefiori paneling that can be seen at the center of the image, and 28 blue-glass studs that enhance the piece. Kendrick considered the piece to be a 9th Century artifact and whilst other classification of it from the 8th Century has been met with more agreement, its assumed date has varied between the two periods over the years since its re-discovery. Crucially, the real importance of this object is its information on a relatively unknown object type, as only a small selection of bowls survive from the period, with just two other silver hanging-bowls on record, one from the St Ninian’s Isle treasure and the other from Lejre, Denmark. Other hanging bowls made from materials like copper and bronze exist, such as the Sutton Hoo example below, but nothing in the same precious metals. Of the examples that are known, it has been documented that the Witham bowl is the most decorated of the three (The Lejre/St Ninian’s), especially due to its internal representation of a quadrupedal animal and a series of human heads on the base of the exterior. 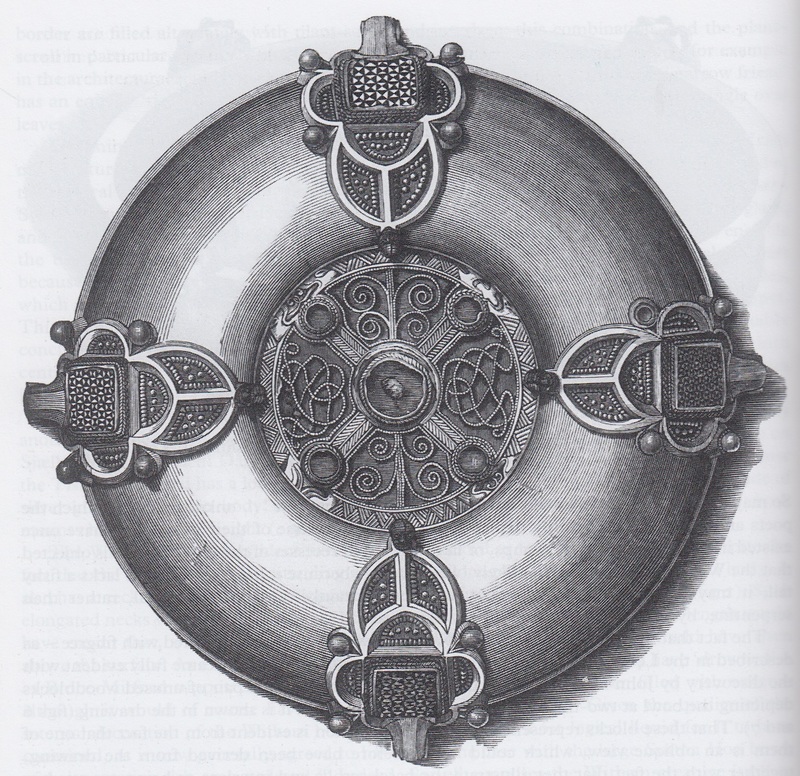 If the drawings of the piece are accurate, its preservation also places it as the best preserved example of metalwork from the period with its surviving internal creature installation, cross referenced examples of which can be seen below on the Bornholm bronze bowl, which, found in 1995, is clearly linked to the Witham bowl in some way. Two views of the Bornholm bronze mount from Agerbygard. What was the bowl used for? The most logical idea is that it was filled with water and the Witham animal, identified by Rupert Bruce-Mitford as a ‘sitting dog’ would have been tall enough to enough to break the surface of any kind of liquid filling the interior. It is stated that due to the quality of its workmanship, holding water was the most logical use for the bowl and it has been generally agreed that this was also the use for the Sutton Hoo bowl, seen above. It has also been suggested that the pedestal on which the creature of the Witham bowl sits could have rotated, because the drawings have shown the orientation of the centerpiece in more than one alignment, but with only illustrations to represent the artifact, it is impossible to argue this too strongly. Whatever is found on land or in the sea of the unknown and fearsome form of terrible bodily appearance can be called a beast. The kinds of sea-beast are almost innumerable, and with their so enormous bodies they churn up vast masses of waves as big as great mountains, and with their chests disrupt seas from the very bottom, whilst they direct their paths to the sweet river-courses and by swimming disturb the foamy depths with a great roar…(Liber Monstorum(c 725), Prologue to Book II). A lifeline on the bowl’s whereabouts? In 1960, a discussion on the bowl highlighted that it had been exhibited in Leeds and Lincoln in the mid 1800’s, this was also the first time that the piece had been referred to in print and following this article, in 1961 a wood block shot of the bowl (seen below) was used in Archaeologia, by Vera Evison. The other shot of the base, was not used for another ten years, until 1973 and as both highlight different angles of the bowl than we see in the original watercolours, it has been suggested that these wood blocks represent a separate commission. Perspective woodcut of the bowl. Woodcut of the underside of the Bowl. Society of Antiquaries of London. It was found in clearing out the bed of the River Witham, near Lincoln, about 1820, and was purchased by the late Coningsby Waldo Sibthorp, Esp., by whom it was bequeathed to his brother-in-law, John Hawkins, Esq. In carrying out the works for the improvement of the river Witham, many sub-marine articles have been thrown up: lately near Washingborough, about 4 miles from this city, a complete canoe was found, of the length of 30 feet 8 inches, 2 feet high at the sides, and about 2 feet 6 inches wide, made out of a single tree: after being exposed to the air, it was found impractical to move this curiosity, the least movement causing it to break. A great number of trees, several yards under ground, deer’s horns, some of them very large, and human sculls, &c. have been found; but the object of greatest value is a beautiful silver cup or basin, richly ornamented with wild animals, &c. and having in the center a small statue: this is now in the possession of a gentleman in the neighborhood. A vessel of Silver-gilt, probably of Anglo-Saxon work… From the center of the inside rises the figure of a lion. The rim has been formed for the admission round it of a cord or chain, but the use to which the vessel has been applied in uncertain. It was found in the river Witham, near Lincoln. IX CENT. Drawn suspended, along with detail of its millefiori, there is evidence that the bowl may have been displayed in an elevated state in the A W Franks exhibition, as scribbled on the back of a letter to Albert Way in the Society of Antiquaries library dated to the 15th June 1849 is a crude diagram of the bowl, the low quality of which suggests that it was hastily done. Such a humanistic link to the bowl is tantalising and thinking of the many people who would have laid eyes on a piece of history that is now lost it is only in retrospect that we can consider important the piece could be if it was still visible to the public today. Whether it still exists, or not is unknown and perhaps one of the only lifelines for its survival is that its beauty and preservation may have placed it at the heart of a collectors possession and if it does indeed sit in a private household, or estate it can only be hoped that it is still being coveted and treated with the respect it deserves. But where could it be? It is a reasonable assumption that it vanished years before Kendrick began his investigation and it seems sensible to assume that at some point A W Franks, described as “arguably the most important collector in the history of the British Museum, and one of the greatest collectors of his age”, would have made an attempt to add the bowl to his collection. With such recognition, any public sales would have at the very least have been documented and likely recognised by Christie’s, or agents of the British Museum. So, turning to the family, might it still be in their collection? It is noted that after the death of Hawkins, his estate was left to his daughter, Mrs Josephine Johnson and it has been noted that after his death much of Hawkin’s collections were relegated to a ‘museum room’ due to her lack of interest in the objects her father coveted. It is presumed that its disappearance occurs at some point after her death when the family estate was sold and if any trace of the bowl is to be found, it would be on the trail of this family estate. Perhaps, somewhere in a private collection the bowl still lays, but until it is found, it will forever be an archaeological mystery and one of the greatest lost examples of Anglo-Saxon silverware ever found. Created in 3DS Max using the Corona Engine. Edited in After Effects and Sony Vegas. Specialist input from Professor David Hinton. Model created by Dr Gareth Beale. Materials, lighting, animations and scene creation by ArtasMedia. Next post ArtasMedia is featured at the Milan EXPO 2015 in the Ara Pacis!